Globe reporters bring you the latest from the sectional finals. 63 yard run for a touchdown by St Mary's James Brumfield with 22 seconds left in the half. Waiting on extra point. A Drew Galley TD pass to Manning Sears has Marblehead up 14-0 at the half. Brad Rogers with his third score of the half. A five yard rush. 20-0 Hanover. 2:40 left in the half. St. Mary's James Brumfield has 121 rushing yards on eight carries and a touchdown in the first half. Brighton is set to receive the kickoff and start the second half. East Bridgewater will receive to start the second half. Need to get something going offensively. Chad Peterson finds Kyle McCarthy as time expires in the half. 30-yard TD reception, which came after a Maimaron interception. 12-7 Duxbury. St. Mary's Marcus Atkins has 21 yards passing with a touchdown and 11 rushing yards through one half of play. Half: @DuxburyFootball 12, North Attleboro 7. Maimaron with a 1-yard TD run and 34-yard TD pass to James Miele, but a costly late pick. 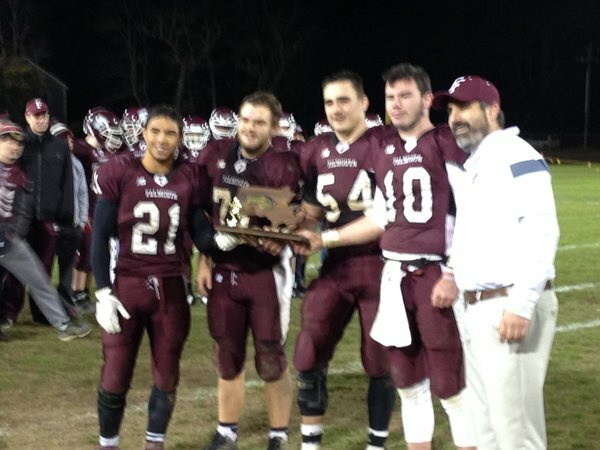 EMass football historians... When is the last time Holliston trailed by 20? Stoneham's Tre Pignone had 68 rushing yards and 38 passing yards in the first half. Matt Nemiskern sacks Barrett on 4th down. 1:01 left in the half. Halftime: No. 19 Hanover 20, No. 11 Holliston 0. Maimaron 8 carries, 53 yards, 1 rushing TD; 8 for 15, 114 yards, 1 passing TD, 1 INT. North Attleboro's Kyle McCarthy 2 rec., 74 yards, TD. Brad Rogers: 12 carries, 100 yards, 3TDs at the half. Wyatt Shisler: 7 carries, 96 yards. Holliston ran all but 1 play through Jack Barrett, 23 touches (12 rushes, 11 passes) he has 37 yards rushes. 6 completions for 51 yards. Correction. All but two plays. One of them the forced fumble by Hanover's Mike Nimeskern at the 6 yard line. Turning point of game. Second half underway at Duxbury High. Dragons lead 12-7, North Attleboro has the ball in its own territory. EB forces a Norwell punt and it goes off the side of the punters foot and rolls a total of nine yards. End of 3. Norwell 14, EB 7. Shisler and Rogers racking up the stats. But the holes made by Pat Flynn, Matt Hughes, and Tim Mullane have been massive. Brighton's Hall and Clark connect for an 11-yard TD. The conversion gives Brighton a 36-14 lead with 2:39 left in the third. Also, a shout to the @HanoverHSMA marching band. Best one I've seen this year.